Space Force is getting closer to reality. 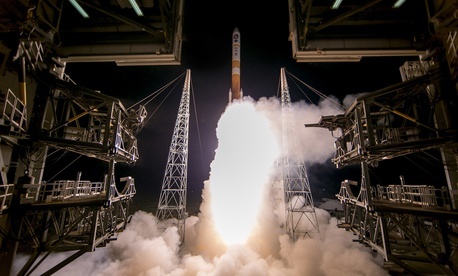 As early as this week, the Pentagon is expected to announce various steps to reorganize the military’s space-related procurement and operations, culminating in a planned request for congressional action to authorize the creation of a separate service branch for space. U.S. Space Command, a new combatant command staffed by space warfighters from the existing military branches. Space Development Agency, an organization that would oversee the development and purchase of new satellites. Space Operations Force, a new warfighting community that would draw operators from all service branches. The Pentagon says it can make these changes on its own, without Congress, but the actual creation of a separate branch requires new legislation. Over the weekend, President Trump repeated his call for a Space Force at an Aug. 4 rally in Columbus, Ohio. “Look, so much is happening now in space and I’m not just talking about Mars and the moon, I’m talking about tremendous defense capability, offensive capability, it’s in space so we’re going to do the Space Force,” he said. Like many Pentagon initiatives these days, speed is the emphasis — largely to outpace Chinese and Russian developments in space. But here are five questions not answered in the report. How does a Space Force — in the short-term and long-term — make the U.S. military more lethal? Creating a more lethal military has has been a top priority of Defense Secretary James Mattis. The draft report mentions China and Russia’s growing abilities to shoot down, jam, or trick U.S. satellites that are fundamental to navigation, banking, and communications. “The President has articulated a compelling vision for a Space Force that protects the U.S. economy and way of life,” the draft report said. But has it? While the organizational changes described in the draft report aim to better integrate space into day-to-day operations, it does not articulate how a new branch of the military will further that. Or take the report’s statement that U.S. Space Command teams will be embedded within the combatant commands for Europe and the Indo-Pacific by next summer. The report does not say how the new teams will increase the lethality of the forces they are supporting. What analysis went into this plan? The Pentagon is often criticized for over-studying an issue, for launching years-long reviews and producing countless analyses of alternatives. But the Space Force proposal appears to suffer from the opposite. The 14-page draft report provides no insight into how its authors came to make its recommendations. Numerous commissions and reviews were part of the creation of the Army Air Corps and eventually the U.S. Air Force in 1947. This time around, there is no presidential commission of retired generals, admirals, former defense secretaries, NASA administrators or senior intelligence officials. CNA Corp. is looking into the creation of a Space Force. Will it make similar recommendations? Who helped craft the report? Sources say the Space Force report was assembled by a small team in the Office of the Secretary of Defense, including staffers from Deputy Defense Secretary Patrick Shanahan’s office and Stephen Kitay, deputy assistant secretary of defense for space policy. Kitay previously was a professional staff member on the House Armed Services Committee Strategic Forces Subcommittee, which is chaired by Rep. Mike Rogers, R-Ala., the congressman who last year called for creating a Space Corps within the Air Force, akin to the way the Marine Corps is part of the Navy. What’s interesting is that — according to several sources — the Air Force, the service that stands to be most affected by the plan, was largely cut out of its creation. In the coming months, a “governance committee” — led by Shanahan and made up of top Pentagon leaders — will put together a legislative proposal that Congress would need to pass in order to create the Space Force. How much new bureaucracy will this create? “The Space Force will focus on aligning existing capabilities and accelerating new warfighting capability, not overhead or headquarters growth,” the draft report said. For comparison purposes, this year, the Air Force is estimated to have 15,574 (about 7,500 uniformed military and nearly 8,000 civilians) positions in military headquarters. The Army has an estimated 14,000; the Navy 8,527; and the Marine Corps 2,725. The Army National Guard has an estimated 1,324 headquarters positions while the Air National Guard has only about 318. The figures are part of the Pentagon’s latest Defense Manpower Requirement Reports from June. What happens to the Space and Missile Systems Center? The Air Force spent four months figuring out how to transform the Space and Missile Systems Center into a more nimble organization that can buy satellites and launch them faster. With the creation of a new Space Development Agency — at a yet-to-be-disclosed location — to oversee all new space acquisitions (current satellite programs will stay under SMC), the long-term future of the Los Angeles-based organization and its 6,000 employees is in question.